Here he is! Don't you just love that adorable grin? We're still in our bonding stage, so he doesn't have a name just yet. So far, he plays well with others and likes to run around without his top on. 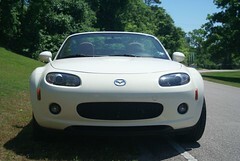 He's a Brand New 6 speed Mazda MX-5 GT in Marble White. The saddle brown leather interior and top lends to his toasted marshmallow feel. And so I've been calling him my mashimaro (marshmallow in Japanese). You Mashimaro is sweet and really does look like he is smiling! lol. Thank you! I love how he drives, I can't wait to take him on a long road trip!